Daniel Bateman of Glide, Oregon shows off the 3x3 mule deer buck he took during the first week of the 2001 Oregon archery deer season. 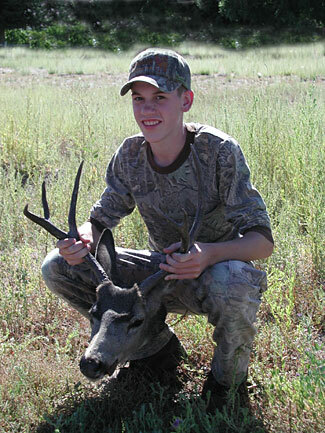 This was the second deer for Daniel since he began hunting deer. He shot the deer behind the front shoulder at a distance of 25 yards using a PSE bow and an Easton arrow.